SEOUL, April 17 (Yonhap) -- South Korean stocks finished slightly lower Wednesday as investors opted to cash in recent gains following a bullish run, analysts said. The Korean won rose against the U.S. dollar. 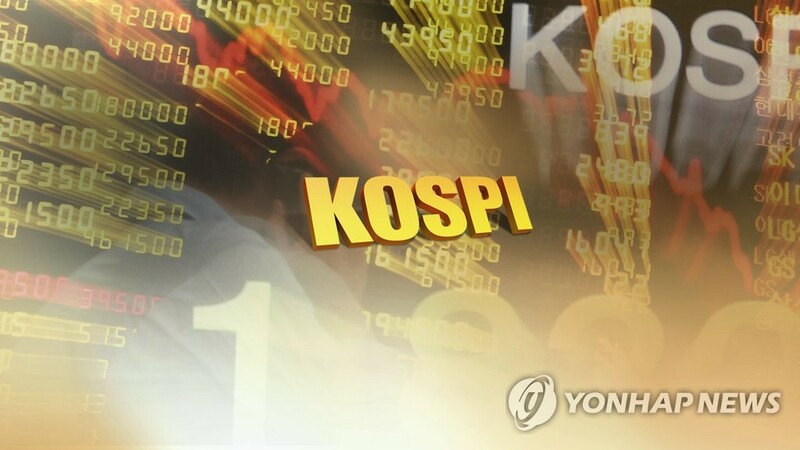 The benchmark Korea Composite Stock Price Index (KOSPI) inched down 2.74 points, or 0.12 percent, to close at 2,245.89. Trading volume was moderate at 445 million shares worth 5.42 trillion won (US$4.77 billion), with gainers outnumbering losers 470 to 372. Analysts said Seoul shares closed slightly lower as investors sought to lock in part of recent gains after the index closed higher for the 13th consecutive session on Tuesday. "The investors' sentiment itself is not weak, with Wall Street closing higher on the back of robust performances of listed firms," Lee Yong-gon, a researcher from Hana Financial Investment, said. The analyst said Wednesday's decline is part of corrections after a stretched bullish run. Foreigners scooped up a net 75.9 billion won worth of shares, while institutions sold a net 1.1 billion won. Individuals sold a net 49 billion won. Market kingpin Samsung Electronics shed 0.42 percent to 47,050 won, and No. 2 chipmaker SK hynix lost 0.25 percent to 80,200 won. LG Electronics fell 2.57 percent to 75,900 won, and LG Display slipped 0.69 percent to 21,700 won. Pharmaceutical firms were mixed, with Celltrion adding 0.24 percent to 208,500 won while Hanmi Pharmaceutical decreased 0.35 percent to 430,500 won. Samsung BioLogics rose 0.68 percent to 369,000 won. Carmakers closed higher, with Hyundai Motor adding 1.95 percent to 131,000 won and auto parts affiliate Hyundai Mobis advancing 2 percent to 229,500 won. Kia Motors moved up 1.2 percent to 42,300 won. Financial firms closed lower, with Shinhan Financial sliding 0.33 percent to 45,550 won and KB Financial edging down 0.32 percent to 46,150 won. Shares of Asiana Airlines moved down 15.74 percent to 7,120 won, ending sharp increases in the past few days following its parent firm's announcement that it will sell shares in the country's No. 2 air carrier. Its bigger rival Korean Air moved up 0.14 percent to 35,900 won. The local currency closed at 1,134.80 won against the U.S. dollar, up 0.90 won from the previous session. Bond prices, which move inversely to yields, ended lower. The yield on three-year debts gained 1.3 basis points to 1.778 percent, and the return on benchmark five-year government bonds added 1.6 basis points to 1.823 percent.